Diggin' in Virginia XIX was my third opportunity to attend one of John and Rose Kendrick's amazing DIV events. If you're unfamiliar with DIV and want to learn more about it, visit the DIV home on mytreasurespot.com. The first DIV I was fortunate enough to attend was held at Cole's Hill in Culpeper, VA. Cole's Hill was the site of a large Union Army encampment during the winter of 1863. Many of the troops stationed there would go on to fight Lee's army at Gettysburg. But before that harrowing experience, they had to endure the challenges of surviving Northern Virginia winter. They accomplished this by constructing huts and tents on the defensible high ground of Cole's Hill. Imagine being able to walk that same hill today. Now imagine being able to metal detect it and you'll begin to understand why DIV is truly an incredible experience. 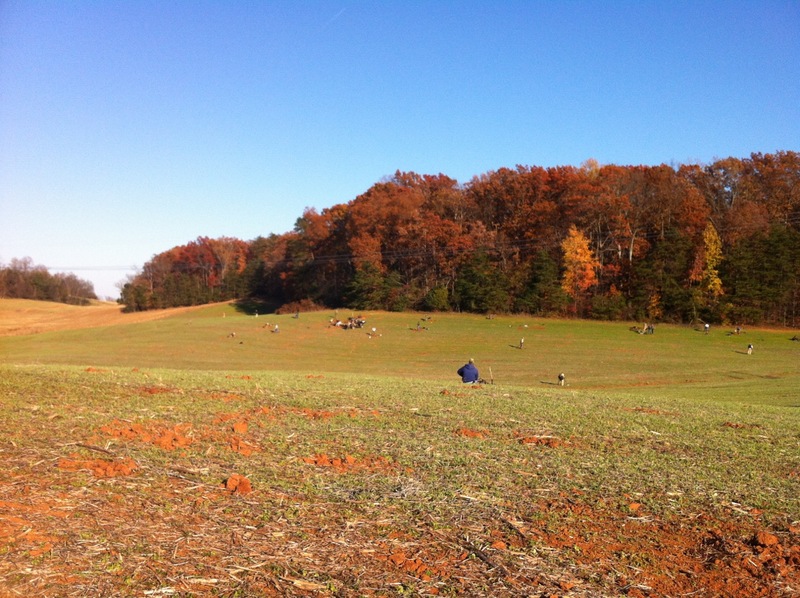 This year at DIV XIX we returned once more to Cole's Hill but extensive acreage to the south including Hansbrough Ridge was added to the hunt area along with several fields that had never been open to organized detecting with pulse induction machines. 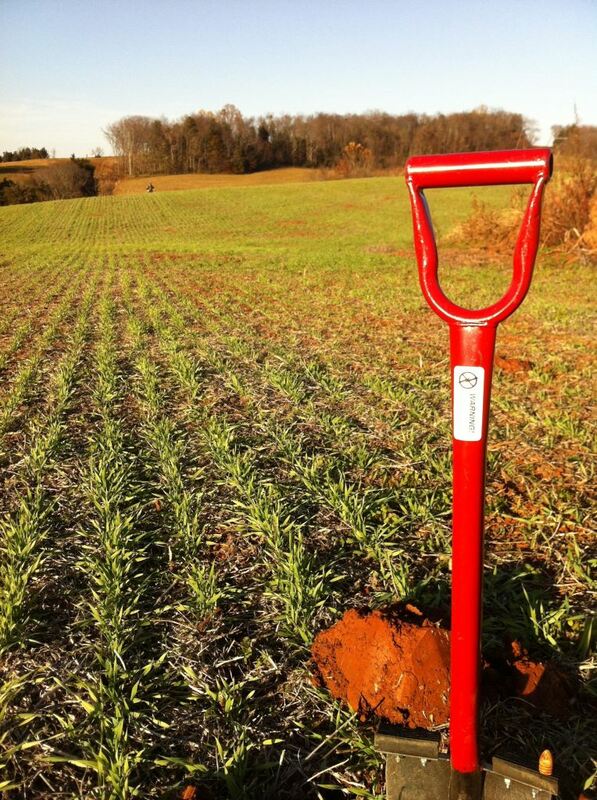 The soil in Culpeper is notorious among metal detectorists as being "hot." 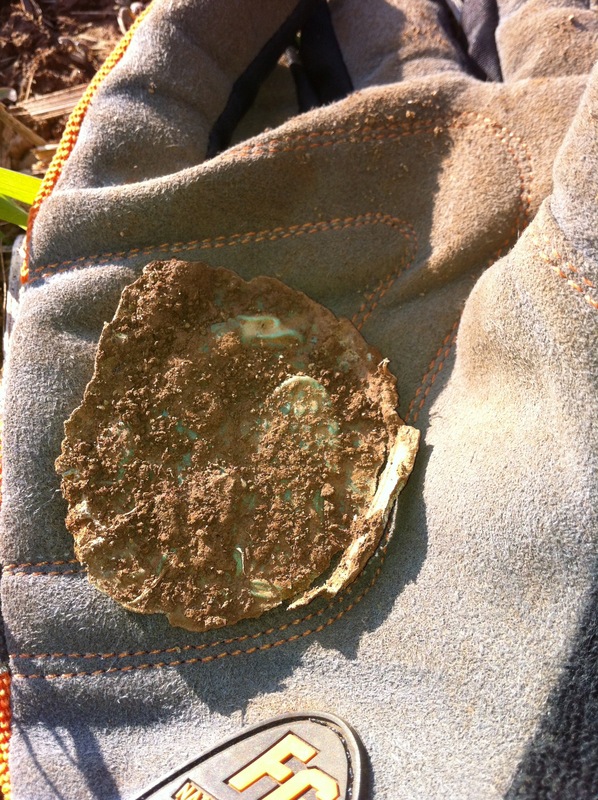 It's not much of an exaggeration to say that the dirt is literally iron and it presents a real challenge to VLF metal detectors, most of which can't differentiate metallic targets from the soil itself. As a result of these conditions, and in spite of decades of relic hunting, there remain amazing relics that await discovery today by those with modern metal detectors. Typical Culpeper red dirt. Northern tip of Hansbrough Ridge in background. This was the first DIV where I was able to use my new Minelab GPX 4800. In fact, I had less than 12 hours total on the machine prior to DIV so I was a tad concerned about how I'd fare. Even so, I was excited to have a machine that I knew was capable of significant depth even in mineralized soil and which also had an iron discriminate feature, something that my previous PI machine (a White's TDI Pro) did not. Shortly after starting to hunt on the first day, I got what I call the "dig me now!" signal. It's an unmistakable and very loud tone that starts out low, raises to a peak as you move the coil over the target, and then drops back down to a lower pitch. There was no signal blanking meaning that the target wasn't iron. So I proceeded to dig. And dig. And dig. 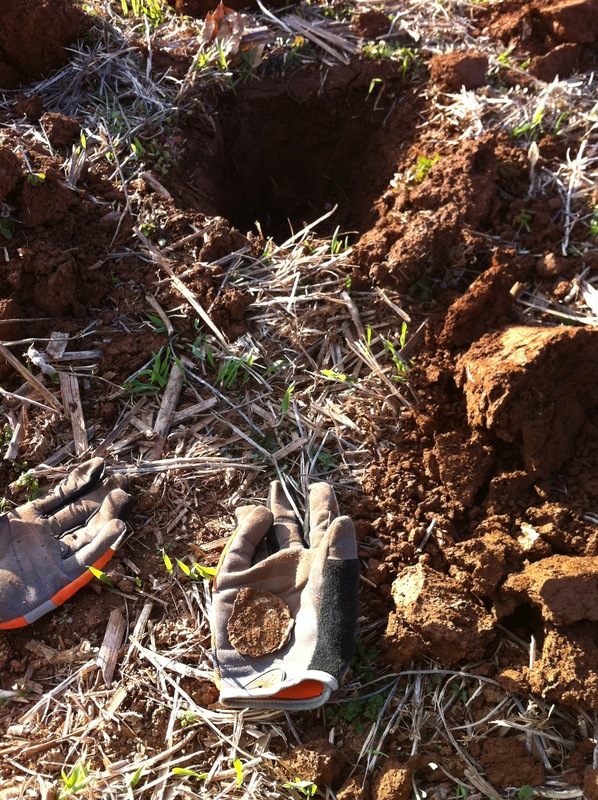 After several shovel fulls of Virginia's "sacred soil," I finally had the target out of the hole. It turned out to be a fairly battered Eagle uniform button. Here's the hole it came out of and where it had lain for the past 150 years. Not a bad start and my first button find with the GPX. Not long afterwards, a gentleman approached me. It turned out to be Kevin Hoagland, Minelab's Director of Education. He asked how I was doing and if there were any questions I had about my GPX. I was really impressed that Minelab had an actual representative at DIV and Kevin is a great ambassador on behalf of the company and their products. The evening before, he gave a GPX seminar to any DIV attendee who wanted to attend. There were about 50 folks in the audience and I'm fairly certain that every one of them wanted the same thing: The golden settings for their GPX! That's not what they got at the seminar. And I think it speaks highly of Kevin Hoagland and Minelab that they didn't just hand out photocopies of recommended soil timings for the Culpeper area. That would have been easy. Instead, for about an hour and a half, Kevin gave a Powerpoint presentation that explained soil timings and taught how to find the ideal settings for any area you might be hunting. Even though I'd read the GPX owner's manual several times and scoured forums for any tidbit of helpful information I could find, I learned several key things in Kevin's talk. They deserve their own separate blog post. And now, here was Kevin walking around DIV, finding folks with GPX detectors, and giving them hands-on tips in the field. That's really an unprecedented amount of customer support and, given the dedication of DIV attendees, a smart investment by Minelab. 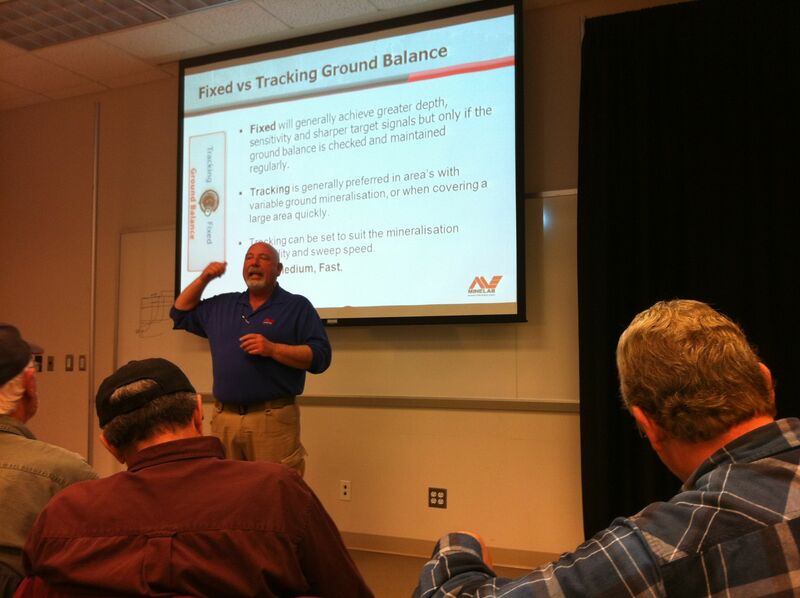 The most memorable quote from Kevin's GPX presentation was, "Culpeper soil is bad, but it's not Minelab bad." I chuckled when he said it and thought it was good marketing, but it turned out to be true. Fast forward to lunch time on the first day at DIV. Other than the Eagle button and a Confederate Gardner bullet, I hadn't found too much. I sat down on a knoll to eat a leisurely lunch while gazing out over the rolling hills of Virginia. A friend of mine, Culpeper local and longtime relic-hunter Frank, called and informed me that he could meet us at a location where they'd found some good relics at a previous DIV. So I headed to that site, turned on my machine, and started to hunt. And immediately, I started getting a lot of good signals. In rapid succession, I dug a few Williams cleaner bullets, some button backs, and a carved button. This locale, situated below the heights of Hansbrough Ridge alongside a stream-bed, had apparently been a campsite—covered by tents, abuzz with martial activity, punctuated by the sounds of camp life, bugles, and occasionally, musket fire or the formidable but exhilarating "whoomp" of artillery. But for the hidden relics, one would never know that that world, so distant in time, had existed right where we stood. All that could be heard was the wind, the warbling hum of metal detector threshold, and the buzz of conversation. 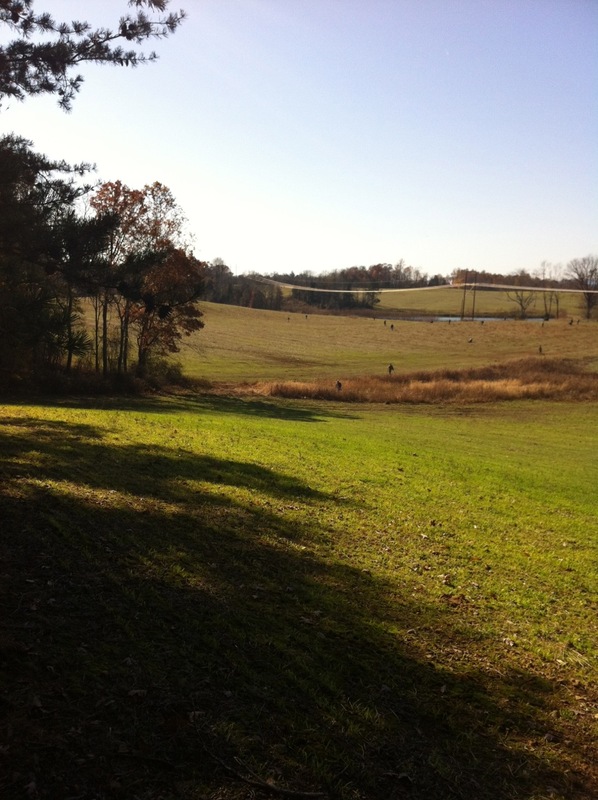 All that could be seen was rows of tilled field warming in the Virginia sun. I was starting to get the hang of the GPX and began to understand its language and tones when I got another good signal. Hoping for another bullet, I dug a 10" plug and ran the coil over it. Nothing. I held the coil over the hole and got an even louder tone with zero blanking. Whatever was still in there was deep and unmistakeably good. Two more shovels full of dirt and I had the target out of the ground and the second I laid my eyes on it I realized that I'd just found my first plate. I picked it up, took off my glove, and held something that was last touched by a soldier in the Civil War, standing on this very spot. 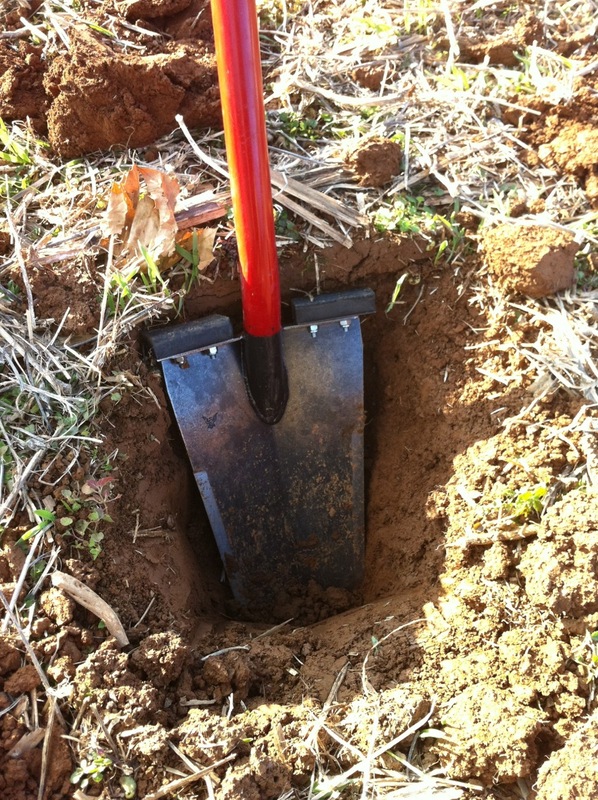 Curious, I placed my Predator Tools Big Red shovel into the hole. The blade on this formidable digging tool measures 13.5" indicating that the hole was about 15" deep. Not only was this the deepest relic I'd ever found, but it was also the most significant. Thanks to DIV and Minelab, I was able to touch a piece of history unseen for 150 years, save it from further deterioration, and share it with others. That's what this blog is all about — thanks for stopping by.